Bolivian voters’ rejection last week of a constitutional amendment to allow an incumbent president to run for a third consecutive term is a setback for President Evo Morales but a step forward for the country. Both the government and opposition understood the national referendum as a plebiscite on Morales, who is now the longest serving head of state in Bolivian history. Had the referendum passed, Morales would have been able to run for a fourth five-year term in 2019. (Because Morales was first elected in 2005, before the new constitution was approved in 2009, the high court decided that he was eligible to run for reelection in 2014.) During the months leading up to the referendum vote, polls showed a narrow gap between the Sí votes in favor of the amendment and the No votes, with a large number of undecided. As the final count began to crystalize (the official count is not yet available), it became clear that No won by a slim margin (51.3% to 48.7%). 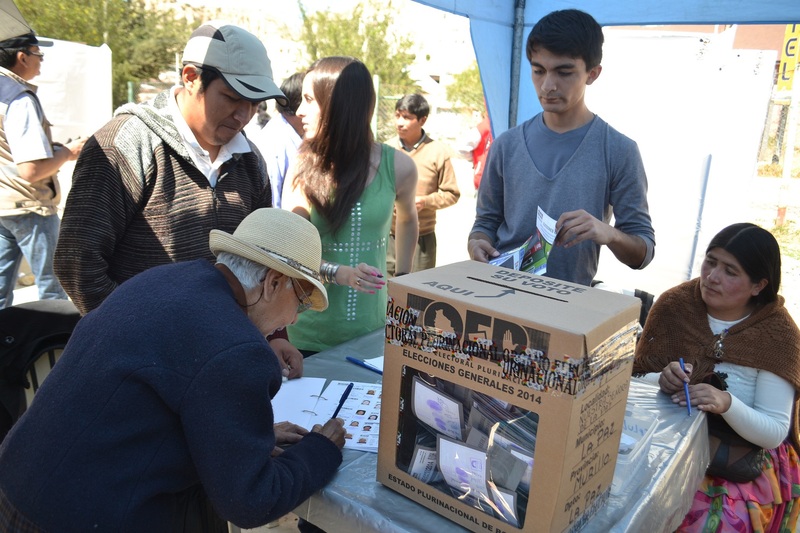 At first, Morales and members of his government disputed the results, arguing that late-arriving rural ballots would vindicate him. Later, they claimed opposition fraud and manipulation, including a “dirty” war waged by the opponents and the media. Several scandals, however, appear to have been the real cause of Morales’s loss. New developments in lingering accusations of fraud committed at the Fondo Indígena, an organization established to support economic, social, and political development of marginalized peoples. Government auditors last year uncovered more than a hundred incomplete or non-existent projects valued at tens of millions of dollars. The case involved several ex-ministers in Morales’s government and leaders of his MAS party. New allegations of corruption involving Gabriela Zapata Montaño, a romantic liaison of the President in 2006 who is now an executive for a Chinese-owned company (CAMC) that was awarded a large number of no-bid contracts for government development projects. Some sources claim millions of dollars have been misappropriated. Zapata was arrested shortly after the vote. Accusations that the MAS (and, implicitly, Morales) instigated angry protesters to attack the municipal building in El Alto, Bolivia’s second largest city, killing seven people and injuring many others. The mayor, Soledad Chapetón, and La Paz provincial governor Felix Patzi, a former education minister under Morales, were the first two opposition candidates to win those positions since MAS came to power. The government dismissed the allegations and suggested that Chapetón orchestrated the violence to make herself a martyr. The results of the referendum – and, more importantly, the frenzied reactions from Morales and other high-ranking members of his government – make the immediate future appear uncertain. Morales accepted the results of the referendum but also ominously pointed out that there are other ways to amend the constitution. He also dared opponents to initiate a recall referendum to remove him. Nevertheless, some members of MAS – showing eagerness to carry the party’s wide support among Bolivians into the future – have begun publicly discussing possible successors. 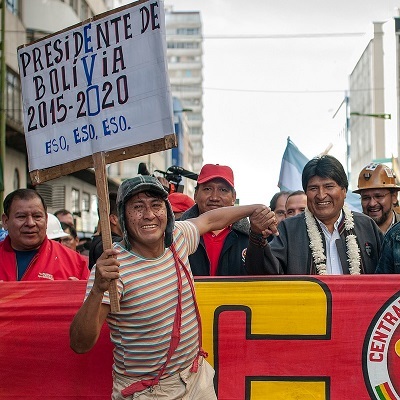 Another positive sign is that Bolivia’s electoral court showed itself to be truly autonomous, bolstering opposition confidence in a key institution. The question is whether Morales believes his party (and by extension his legacy) is worth preserving, or whether he wants to risk them for another dubious bid for reelection. Claims that Morales’s setback is part of a “conservative tide” sweeping through Latin America may be premature, but this referendum may have repercussions elsewhere. Ecuador’s Rafael Correa’s public comments that he would not seek reelection in 2017 may now become firmer. The day of the three- or four-term president seems over. * Miguel Centellas teaches political sociology at the Croft Institute for International Studies at the University of Mississippi. A Bolivian referendum on February 21 – one month after the 10th anniversary of President Morales’s rise to power – threatens a break with the country’s tradition and the democratic principle of power alternation. A “Yes” vote on the constitutional amendment up for approval would allow Morales and Vice President García Linera to run in 2019 for a fourth consecutive term – a scenario that the fragmented opposition claims would mean not only greater concentration of power in a personalistic leader but also a shift toward authoritarianism, similar to that in Venezuela. The government claims that a “No” vote would mean the end of an era of unprecedented economic and democratic stability, the end of measures that have empowered subordinate groups in society, and the return of the right and neoliberalism. Opinion polls so far show the vote will be close. Morales’s efforts to extend his time in office are consistent with his tendencies to dominate politics and the policy process. Yet my research shows that increased political incorporation during his government has also given previously marginalized groups enhanced influence over agenda-setting and policy-making and led to important shifts in domestic power relations. In today’s Bolivia, well-organized interest groups typically belonging to the “informal” labor sector (such as coca growers, cooperative miners, and transportation unions) have greater influence over policy from within the state (in representative institutions and state bureaucracies at all levels) and from without (direct pressure in the streets). This has resulted in greater regime responsiveness to the groups’ interests and in policies that expand economic and social benefits, as well as improvements in poverty and inequality reduction – even without meeting some of their fundamental needs such as employment and health care reform. While in some instances newly empowered groups have mobilized and served as a check on state power, their role is founded on a highly particularistic relationship of the MAS and allied groups and, as such, can actually be an obstacle for governing in the interest of broader segments of society. An intense government campaign in favor of the constitutional amendment is already under way and will likely deepen in the coming weeks. The Morales government lacks the kind of epic framing it had when it first won the presidential election in 2005. Citizens today express concerns similar to those voiced during previous governments – concentration of power, widespread corruption, inefficient institutions, weak protection of liberal rights, politicization of courts, and hostility to opponents and the press. A “Yes” victory on February 21 would not automatically mean a shift to an authoritarian regime as core features of authoritarianism (i.e., power exercised by a small group overriding the will of the citizens) are not currently evident. In addition, Morales’s tendencies to dominate often meet strong checks from a relatively autonomous civil society. Comparative evidence suggests, however, that a fourth Morales term might lead to further power concentration and decreased political input from below — which could mean a weakening of the MAS as an organizational actor for the empowerment of subordinate groups independent of its undisputed leader. A “No” victory, on the other hand, would not necessarily mean the end of the social and political transformations carried out by the MAS. If nothing else, Bolivia’s “process of change” over the past decade has given rise to a “new normal” of more inclusive institutions and basic social programs that benefit large sectors of the population and will be difficult for any future government to reverse. * Santiago Anria is a postdoctoral fellow at Tulane University’s Center for Inter-American Policy and Research. As Bolivian President Evo Morales’s Movimiento al Socialismo (MAS) prepares for the October 12 general election – which opinion polls indicate it will win by wide margins – the MAS appears to be a remarkably diverse organization capable of adapting operations to different regions of the country. It fits neither the typical journalistic portrayal of Latin American social and political movements as clashing with political parties and elected governments, nor political scientists’ characterization of parties as unitary actors under the control of a unified leadership. Founded by coca growers in the mid-1990s as their “political instrument” to contest power, the MAS has become the collective political expression of grassroots organizations now in power – to this day having diffuse boundaries and multiple faces, combining features of a grassroots movement and a party, and being a remarkably successful instrument for exercising rule. The MAS’s regional diversity is one of its greatest strengths. As an organizational actor, it looks and operates differently in different contexts depending on how the political space is structured. In the Bolivian central region of the Chapare, where strong peasant unions are aligned with the MAS and control the territory, civil society and party are fused. Grassroots organizations monopolize the political space, and local decision-making structures are embedded in the union structure. Their success is rooted in “agrarian union democracy,” which emphasizes that “bases” exert control on the leadership – that the rank and file should lead and leaders should follow. In the eastern city of Santa Cruz, on the other hand, the MAS has made inroads in traditionally hostile territory by developing an unusually strong local party organization with remarkable mobilization capacity, and that capacity gives it a central role in local governance. As in other cities with large informal economies, the local structure draws support from two powerful urban sectors – transportation workers and street venders – and is organized territorially in districts that operate both during and between elections. Rather than having the features of a movement, in Santa Cruz the MAS looks and works more like a conventional political party. In the Chapare, Santa Cruz and elsewhere, the MAS organization has considerable latitude to operate locally within alliances and policies usually defined at the national level. As a result, the MAS and its governmental counterparts are not often, or by necessity, in tension. Latin American history offers many examples of political movements becoming personalistic vehicles for charismatic leaders. More than 10 years since it became a credible electoral vehicle, the MAS may offer a more promising organizational alternative. Morales is certainly a charismatic leader, with significant popular legitimacy and authority within the MAS. His leadership cannot be overstated, and he is the dominant figure binding a wide array of grassroots movements and organizations. Yet, the MAS has remained permeable to popular input in areas where civil society is strong and has mechanisms to arrive at collective decisions. In the last general elections in 2009, grassroots influence was consequential: it led to the massive entrance of individuals and members of allied grassroots organizations into the highest level of political representation. Their participation in Congress (the Plurinational Legislative Assembly) has pushed to diversify the legislative agenda still largely subordinated to the executive. New MAS leaders willing or able to challenge Morales’s leadership have not emerged but, as the candidacies for the upcoming elections are defined, the strong regional dynamics could alter the composition of the new parliamentary group. Whether the MAS will remain open, and whether it will manage to outgrow its dominant leader figure, will depend on the continuing strength of allied groups in civil society. *Santiago Anria is a Ph.D candidate in political science at the University of North Carolina at Chapel Hill. Will Bolivia’s Half Moon Rise Again? In early 2014 Bolivian President Evo Morales’s main nemesis, the Media Luna (or Half Moon), composing the eastern departments of Tarija, Pando, and Beni, and led by the economically powerful department of Santa Cruz, has all but vanished politically. Morales is a prohibitive favorite to win a third term, while the opposition Social Democratic Movement built on the vestiges of the Media Luna is not a serious electoral contender. In 2008 this seemed highly improbable. 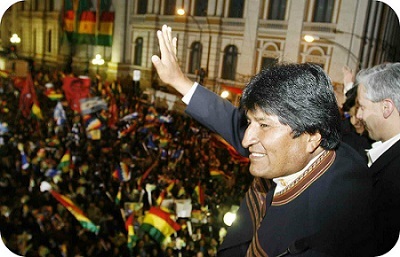 Evo Morales was in a battle for control of Bolivia’s future. The Media Luna was in open revolt. The conflict had begun with Morales’s election in 2005 and was exacerbated by the acrimonious constituent assembly of 2006-2007. It came to a head over the MAS government’s intention to nationalize the country’s natural gas industry and use royalties from Tarija’s vast reserves to fund a new national pension plan. The Media Luna wanted greater regional autonomy and control over revenues. Its August 2008 revolt, which raged for several months, included a region-wide strike, widespread road blocks, takeover of natural gas facilities, government offices, and airports, and violent skirmishes between youth brigades and the police and army, culminating in the killing or wounding of dozens of pro-MAS indigenous marchers in Pando. Then what happened? The Media Luna, led by elites who had dominated Bolivia’s economic and political fortunes at least up through the second Banzer regime (1997-2001), discovered the limits of its diminishing influence. Throughout the conflict in 2008, Morales maintained control of the machinery of state, including the police and the military, while opposition leaders lacked a political party, critical presence in government, or the international leverage to oust the MAS government. Nor did they have a clear agenda beyond opposition to Morales. Their at times racist attacks fueled national outrage, mobilized defenders of the government, and elicited international condemnation. Accused of conspiring with the Media Luna, the U.S. ambassador was expelled. Media Luna overtures to the OAS were rejected. Most tellingly, UNASUR issued an unequivocal statement supporting Morales’s “constitutional government” and comparing Media Luna tactics to the ousting of Chilean President Salvador Allende in 1973. Morales’s 67% victory total in the 2008 recall vote, convened as a concession to the opposition, hastened its fragmentation. Moreover, the MAS has made steady electoral inroads in the East, in part capitalizing upon a demographic shift. Santa Cruz is now far from “wealthy and white,” and the MAS enjoys sizable support among indigenous groups, highland in-migrants, urban and rural poor, and small business owners. Support for the MAS led to popular rejection of autonomy initiatives in these departments. The MAS has also successfully recruited candidates among former elite enemies, a strategy of cooptation that has enabled it to gain six of nine governorships (including in Pando). Even in the once reactionary bastion of Santa Cruz, the MAS won nine of fifteen provinces in the most recent elections. At the same time, the MAS has promoted its model of state capitalism with the private sector, promising to respect private property, and pledging economic development, even as it has begun to expropriate the agricultural holdings of many lowland opposition leaders. What seemed an existential threat to Morales and the MAS in 2008 has been reduced to a disjointed cadre of right-wing ideologues in 2014. The fate of the Media Luna is a lesson about the sometimes rapidly changing political and economic circumstances around elites in Bolivia and Latin America. The MAS firmly controls the Bolivian state and enjoys broadly distributed electoral support. Despite occasional tensions, neighboring states have also backed the Morales administration. With major agribusiness and hydrocarbons investments in Bolivia, Brazil energetically pressured Media Luna leaders to negotiate with the MAS government. Internationally isolated, lacking a credible electoral instrument, with less economic clout than in the past, Media Luna elites also have lost their historical monopoly brokering access to the global economy. Perhaps hardest to recapture: they no longer appear able to offer a compelling national project or vision for the future.